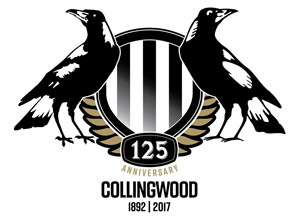 With five games left in the 2016 AFL premiership season the Collingwood football clubs’ hopes of playing finals are gone. If you’re being honest the Pies never really looked like a finals contender this season anyway, as a 4-8 win/loss record after 12 games showed. They did give their fans some hope though with wins over Carlton and GWS but losses to Adelaide and North Melbourne have ended their chances. No matter what excuses the club and it’s staff try and make, it’s simply been another failure of a season for the biggest sporting club in Australia. To miss the finals for a third consecutive season provides little hope for the future also. But there are still five games to be played, and this week the Pies go back home, to the M.C.G. to face a team that will play finals, the West Coast Eagles. The Eagles have had a pretty good season so far backing up from a grand final appearance last year. They find themselves with a 12-5 record after 17 games and sit just a few percentage points away from second spot. There have been questions raised about West Coast’s away form in 2016 but they are positioned about where they would have wanted to be with 5 rounds remaining. Recent history between these two is split at 3-3 at piece, although the Eagles have won the final three games, including a 62 point win in round 6 earlier this year. It’s a game that West Coast have to win if they want to finish top 4 and be seen as a genuine premiership contender. Most articles written about Collingwood at the moment are of a negative nature. That’s understandable too given that the Magpies will miss the finals for the third season in a row. But there are positives out of the mess that is the Pies at the moment. They actually have some of the best young talent in the AFL and some of them are developing at a really good rate. The likes of Moore, De Goey, Aish, Marsh, Maynard, Grundy, Phillips, Crocker and Smith have all shown they have a big future in the senior side. Marsh and Moore may well be the most important of those two in the near future, with key position players so scarce that if they can hold down spots at either end, it will fast track this Magpies rebuild on the run. Apart from the youngsters the Pies have shown that even now this team is capable of beating anyone on it’s day, with dominating wins over top 4 sides Geelong and GWS. That just adds to the frustration for a lot of Pies fans though, with such inconsistency in effort and performance throughout the season. The final 5 games will be important for this team going forward though, and that starts this week of course against the Eagles. Collingwood got relatively lucky at the Match Review Panel for once with no players suspended or even fined despite some very heated moments in the loss to North Melbourne. Ben Sinclair will miss though, after suffering another concussion in the loss to the Roos. 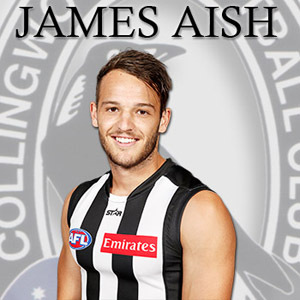 There is still likely to be other changes too, and with the Pies once again losing the centre clearances, the coaching staff may seek to remedy that area. The VFL Magpies had a bye last weekend but still there’s plenty at the next level who could be called upon to take on the Eagles. One that may be considered is Rupert Wills. Wills has been in the best players just about every week in for the VFL team, and is a clearance machine. Others that may be considered include Phillips, Goldsack, Frost,Witts, Oxley, Cox and De Goey. 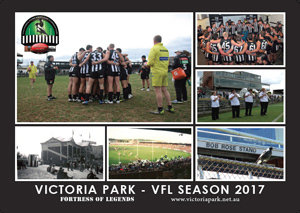 The Pies do have players to choose from so they can select a side based on the opposition as much as their own strengths. One of those main strengths is of course the Eagles forward line, so Goldsack and Frost may be called upon to provide defensive backup if the coaching staff deem it necessary. Last week that Pies backline didn’t perform so well, but a lot of North’s goals did come from turnovers, which are damn hard to defend against. It’s difficult to tell which Collingwood will turn up this weekend. If it’s the version that took care of the Cats and Giants with relative ease then they’ll win this game. If it’s the bad version though, the one that all but gave up in big losses to Port Adelaide and Melbourne, then the Eagles will win easily. My guess is it will be somewhere in between, which will at least give them a chance of notching their 8th win of season 2016. After making the Grand Final last season many were tipping the Eagles to be Hawthorn’s greatest challenger for the premiership in 2016. They didn’t start like a premiership threat, and after 12 games at with a rather average 7-5 win/loss record. Fast forward though and West Coast haven’t lost a game since and will go into this game at the MCG on the back of a 5 game winning streak. There are still critics of this Eagles team though, especially when it comes to their form away from Subiaco. That alone might give them the motivation for this game, where they can prove that they can win away from home against a competitive team. West Coast are hoping to welcome back two big names in Natanui and Sheed so they will run out on Saturday with a very strong lineup indeed. The Eagles forward line is their obvious area of strength. Despite having an up and down year the Eagles sit third for total points scored in 2016, even though they’ve only had the 10th most inside forward 50 entries. Their forward line efficiency per entry is a huge advantage in any game. Of course it helps when you have two elite key forwards in Josh Kennedy and Jack Darling to build an attack around. Kennedy, the reigning Coleman medalist and current leader of that competition, is having yet another stellar year and just seems to get better every season. His battle with Brown and Marsh will be worth watching for sure. He has some help though, with 5 other regular first team Eagles averaging a goal a game or better. The Pies backline struggled last week at times against North Melbourne’s forward line, and they don’t get it any easier this week. The West Coast defense is slightly under rated it seems. They sit fourth for least total points conceded through 17 games which shows the defensive side of the Eagles game is strong too. The backline is pretty stable for them too, with Mackenzie, McGovern, Butler, Hurn and Sheppard making up the core group of this defense. This weekend they matchup against a Pies forward line that basically cost it’s team the game last week. Or at least combined with poor forward delivery they did. The Magpies forward line was disjointed and ugly against North, and when Blair and White are your two most dangerous forwards, something is wrong. 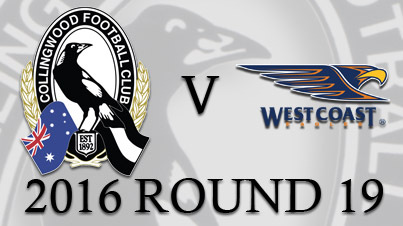 The Eagles will feel confident of restricting the Pies to a low score no matter how many forward entries they get. The Eagles midfield is average, being that they rank in the middle of the ladder for contested possessions and clearances. It’s still higher than the Pies but it’s an area that coach Adam Simpson would want to see some improvement in. Led by the indomitable Matt Priddis this is the one area of the ground the Eagles may have to clean up if they are to return to the grand final this season. After Priddis and Luke Shuey the clearance average for their midfielders drops significantly and there lies the problem. Only those two can be relied upon to win the ball, although the probable return of star ruckman Nic Natanui may help this week. Natanui has been in career best form this season when fit, as shown by him being ranked third for clearances for the Eagles. If he does play, it will be a battle between him and maybe the best young ruckman in the AFL, Brodie Grundy, that will be worth the price of admission alone. This is a must win game for the Eagles. If they can’t win on the MCG against a team who will not play finals, what hope do they have of winning a final or grand final on this ground in the coming months. Most will be expecting the Eagles to come to Melbourne and win this game, especially given the respective positions on the ladder of the two teams. But the Eagles form isn’t as good away from home and in past years their record at the MCG is poor. Of course the Eagles will know that so they may set themselves for this game seeing it as a chance to prove a point. The West Coast forward line is the real worry for the Pies. The Eagles don’t even have to get more inside 50′s than the Pies to be likely winners of this game. But the Pies have improved, even if it isn’t fully showing on the scoreboard. They are more stable now, have a capable ruckman in Grundy and that forward line surely will play better than last week. Where I think this game will be won is in the middle, and with the Pies usually being beaten in there by highly rated teams, they may be able to at least match it with the Eagles in the middle and come out with a small win.